The Lounge Co. is the newest member of the home furnishing group responsible for brands appearing throughout stylish UK homes. Including Parker Knoll, G Plan, and Duresta. 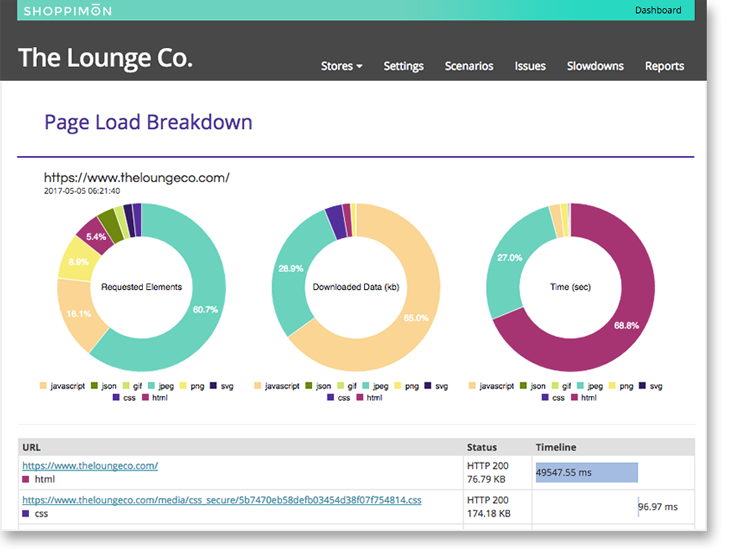 With a young, techwise and on-trend customer base, The Lounge Co. offers a oneofakind shopping experience built uniquely for their clients. When purchasing 1 of over 15,000 tailored sofa or chair combinations online, from home, or at easy-to-use self-order kiosks in one of their 20 countrywide locations, each and every sale is completed through a seamless buying process within the Lounge Co.’s Magento store. When Launching The Lounge Co. in the summer of 2016, the team was acutely aware of the importance their website would play in the brand’s success. Having chosen Magento for its reliability and flexibility in supporting the unique shopping experience they looked to offer, The Lounge Co. created a customized shop where every new order is processed through Magento. Importantly, they also hoped to avoid a complex, lengthy setup process, and prevent the need to constantly update the system over time. Shoppimon is a fully-automated solution built to monitor the health and performance of Magento stores from the point of view of real shoppers. Shoppimon ensures an issue-free shopping experience by identifying problems that block a customer’s path to purchase, before real site users are affected. Brands that leverage Shoppimon, offer a better shopping experience that drives increases in online sales by 12% or more. After looking into multiple solutions, the team at The Lounge Co. chose Shoppimon “because it had all the features and capabilities we were looking for, with the added benefit of being designed to work with Magento out of the box. So, there was no complicated setup or integration,” Joe Ellis explained. Today, by incorporating Shoppimon into their regular routine The Lounge Co. is able to immediately react to any issues that occur. Receiving proactive alerts from the system on bsness-critical issues, from major site outages to exposed error messages and significant slowdowns, Shoppimon ensures the team knows what is going on in their Magento store around the clock. The System provides them with detailed timelines, request breakdowns, screenshots of the store experience during each issue occurrence, and clear plain-English explanations of their causes, providing the transparency and control over store health that The Lounge Co. was looking for. “Anytime we’ve had an outage or site issue Shoppimon has spotted it immediately, alterting the team. It’s been great. Absolutely faultless.” Joe says. 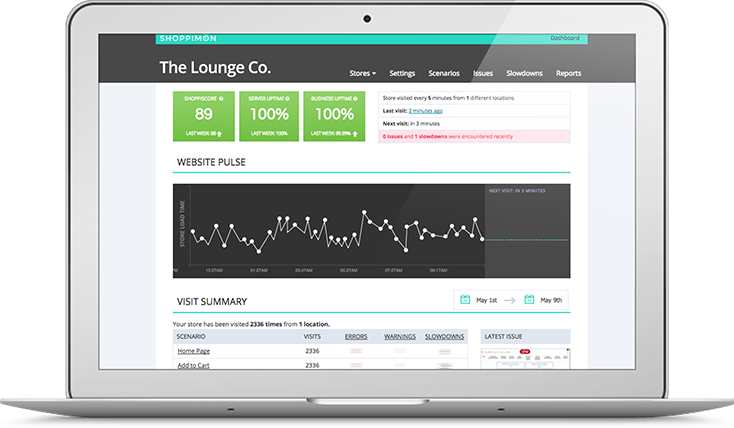 In addition to urgent alerts Shoppimon’s long term health and performance trending, providd by the solution’s reports suite has become an integral part of store monitoring for The Lounge Co. It provides the data and actionable insights needed to keep their full team and compan board up to date on the store’s status, as well as the details their developers need to make both immediate and long term store updates. And it’s paying off for the company in an big way. As can be seen in the above chart, their team’s dedicated work utilizing the insights they receive from SHoppimon, now means The Lounge Co.’s Magento shop has experienced a clear boost in performance, and dramatically fewer site slowdowns.